So. Surely everyone has seen this meme? Hilarious! But also… awww. Amusing though it is to make light of the situation, chronic sleep deprivation isn’t a joke. It’s truly awful and plays havoc with your health. From upsetting metabolism, to messing with digestion, impacting on immune function, mood and cognition. 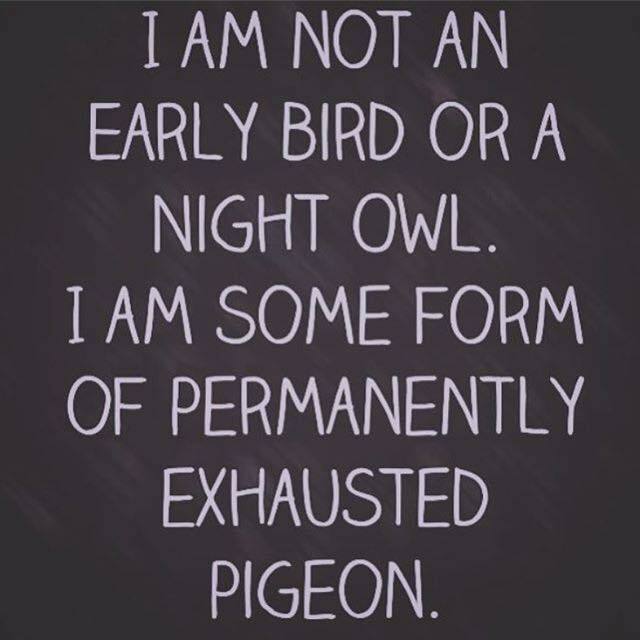 You poor lovely pigeons. You need some support! I really can’t stop talking to people about how important sleep is for health. Subjectively, we all know how much better we feel after a decent stint of decent sleep. And well may we be mindful of that. However, parents of young children, shift workers, overloaded students, folks managing stress and/or sleep disorders often find that a ‘decent stint’ can be hard to come by. And, here lies the problem. By virtue of no other option, people in this situation have to push on through. Maybe you are they? And without adequate support, you will run yourself down. You will crash, in one way or another. And it will not be pleasant. Harsh, I know, but true. It’s not, however, all doom. There are some simple but consistent changes you can make that will help to support your body and prevent burnout. Several years ago I outlined my top 10 tips for nurturing your adrenals, and they all still apply. Basically eat as well as you can, stay hydrated, move your body when you can, and include some supplements to suit your situation. The only thing I would add to this list now, is ask for help. Ask a clinician, like me, for sure. Also ask the people around you, those you are close to. Support from family or close friends is hugely beneficial when you’re under the pump, and I strongly encourage you to reach out to those around you, when you need it. Some tips on sleep hygiene practices. Your sleep cycle and mood. A reminder that sleep is, indeed, medicine.